We’ve all had those days when our legs or arms feel like dead weights and the pain is unbearable. It may have been a more strenuous workout at the gym, a particularly challenging run or bike ride or maybe just the stresses of everyday life. As we get older we feel this pain more and need quick relief and something that heals the inflammation. Chronic pain is classified as pain that lasts 12 weeks or more and according to the American Academy of Pain Medicine more than 1.5 billion people around the world experience chronic pain. It’s the most common cause of long term disability in the US, affecting about 100 million Americans. Muscle rubs offer a quick and instant relief from this pain for many sufferers. Want to know more about muscle rubs? Often sold as pain relief creams or gels, these topical formulas are rubbed into the body to relieve the pain of overworked, strained or sprained muscles. Many creams or rubs work by drawing blood to the injured area while others provide a cooling sensation that eases the tenderness. Some creams even use a combination of both heat and cold to treat pain and attack its number one underlying cause: inflammation. Let’s take a look at how the best muscle rub could help get rid of that pain and keep your muscles performing at their best. With so many different products available we have taken a look at some of the best muscle rubs available today. How do Muscle Rubs Work? As a child many of us were told to ‘rub it better’ by our parents when we felt any soreness. The physical action of rubbing a cream or gel muscle rub helps to warm the injured area and stimulate blood flow. This massaging into the muscles also allows the cream to sink into the skin more readily where it works to relieve pain, soothe any discomfort and speed up recovery. Active ingredients interact with nerve endings to reduce the inflammation and stop the pain messages from going to the brain. The most effective natural ingredients tend to be glucosamine, chondroitin, celadrin, and many essential oils including menthol, eucalyptus and camphor. Some of these will act as a natural anti-inflammatory pain killer in the same way as aspirin. Muscle rubs that act as a cooling agent will reduce inflammation and swelling due to overuse and injury and are more suited to acute injuries as they occur. Warming balms will create vasodilation which draws blood into the skin capillaries and creates a sensation of warmth. This warmth can be ideal for giving long term relief from chronic pain and degenerative diseases like arthritis. Although you may be using a muscle rub to avoid taking any further drugs, you should exercise the same care and caution as taking any other medication. Check with your doctor or a pharmacist before starting to use any type of pain relief for possible interactions or side effects. Follow these tips for a safer use of the best muscle rub. Always follow the instructions included on the packaging or on a separate sheet inside the box. Wash your hands after applying the rub. This is especially important when using products that include powerful ingredients like capsaicin which will burn if you get it in your eyes or on more sensitive parts of the body. Wash any clothes, or other items that may get the rub on them, with soap and water or a mild laundry detergent. Some muscle rubs will stain, or leave a greasy residue on certain fabrics. Always check for any allergies you may have or possible interactions of the ingredients of your muscle rub and other medications you’re already taking. If you notice any irritation to the skin or discomfort then DO stop using the product immediately. Don’t apply the cream to broken skin or open wounds. Try to avoid using after a shower as your pores will be open. Most muscle rubs have powerful active ingredients which will sting on more sensitive, damaged or exposed areas of skin. Avoid using muscle rubs if you’re on aspirin or blood thinners. People with circulation problems or neuropathy shouldn’t use cold treatment muscle rubs. Don’t use a muscle rub at the same as using a heat pad or ice pad. Too much heat will burn and at the other end of the scale, too much cold can result in frostbite. Use in moderation. Many people have reported serious burns to the skin when using more powerful heat rubs. When looking for the best muscle rub to suit your needs, there are almost as many products as there are different muscle pains. We’ve looked at some of the top selling muscle rubs to bring you five, in our opinion, of the best muscle rubs of 2019. This US-made pain relief gel uses menthol and a proprietary blend of ingredients to act as a cooling and analgesic agent for sore muscles. A fast absorbing non-greasy formula, this gel is the preferred choice of many sufferers of arthritis, sore or stiff muscles and joint aches and pains. The large 16-ounce jar ensures it doesn’t run out too quickly and it’s there when you need it most. 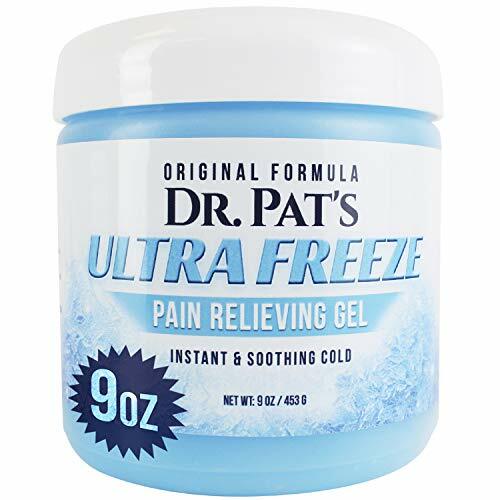 When you apply the gel you’ll feel instant cooling relief which will intensify over the next 10 minutes until it reaches the maximum level of freeze pain relief. This ultra-cold healing sensation then lasts for 30 minutes or longer. Many customers have reported this seriously helped with sciatica, neck and shoulder pain, ankle sprains, fibromyalgia and other muscle pains. The product even comes with a no-questions-asked money back guarantee if you’re not completely satisfied with the gel. Non greasy original US-made formula. Uses menthol for analgesic and cooling sensation. Can remain ultra-cold for 30 minutes or more. much more than many similar products. 100 percent money back guarantee makes it a risk-free purchase. Better suited to acute injuries as it won’t stimulate the circulation. Cold therapy is not recommended for people with circulation problems or diabetics who may not feel any nerve damage. 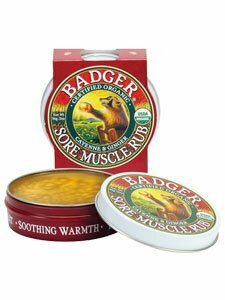 This sore muscle rub was originally developed to help with pain from Aikido that Badger Bill was suffering from, so the story goes. A natural organic formula, it uses capsaicin from cayenne pepper extract that blocks pain signals from reaching your brain. The rub also contains ginger, a natural anti-inflammatory, to attack the cause of the pain. Skin nourishing antioxidants are provided by essential oils of rosemary and extra virgin olive oil used in this rub free of artificial ingredients, fragrances, dyes and parabens. If you’re looking for an all-natural product, you can’t go wrong. (Unfortunately the inclusion of beeswax makes it non-vegan friendly). The product smells great and softens the skin while reliving those aches and pains, not your typical smelly sports rub. Cayenne and ginger soothe away stress and sore muscles. Anti-inflammatory powers of ginger are strong. Essential oils soften the skin. Smells great and most customers who rave about the pleasant scent of this rub find it relaxing. Perfect for using before and after exercise—many arthritis sufferers rate this product over other products loaded with harsh chemicals for regular use. so you should always do a patch test first. Heat may not last as long as similar products and it needs reapplying every couple of hours. Takes about 15 minutes to start working. Deep Blue gel uses a blend of pure therapeutic grade essential oils with a proprietary blend of plant extracts and other powerful ingredients to provide a comforting sensation of cooling and warmth to problem muscles. A base of moisturizing emollients leave your skin hydrated, soft and not greasy. As the name suggests, this gel will target the deep spots that many other creams/gels may have trouble reaching. This product alleviates much muscle discomfort making it ideal for many people including athletes or anyone suffering from chronic pain. Many massage therapists and sports practitioners use Doterra’s Deep Blue proprietary blend in their practice as a go-to cooling or heat rub. You can even find sample packs available online to try and see if this product works for you. Imagine it as Icy Hot but with moisturizing essential oils. Targeted cooling relief cuts the amount of time suffering from sore muscles in half. but then warms and cools again before cooking away the pain. Natural oils have pleasant scent. so you only need the smallest of amounts. No harsh chemicals that irritate the skin. Moisturizes skin with blend of essential oils—no greasiness. and many parents have called this an essential purchase. but there are many cheaper alternatives on the market. The scent can be overpowering. two of the essential oils are classed as hot oils and shouldn’t be used if already hot or sweating. This quality USA produced muscle cream is now sold in over 100 countries worldwide. The cream is good for a variety of conditions including muscle pain and soreness, arthritis or repetitive use injuries. 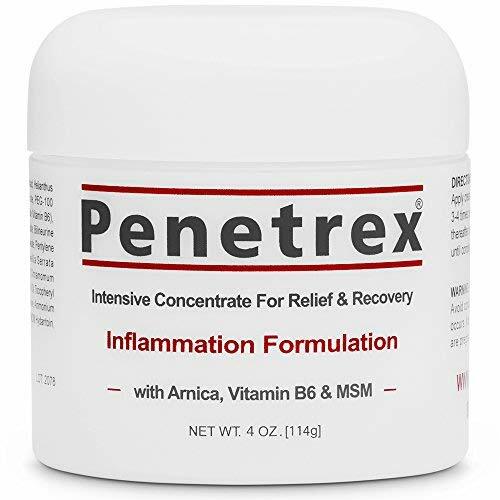 Instead of just masking the pain with a heat or cooling effect, Penetrex addresses the root of the problem, inflammation, which is the cause of most muscle pain. Highly effective ingredients of cetyl myristoleate (CMO) and methylsulfonylmethane (MSM) combine to attack the cause of the inflammation and fortify the physiological cells to fight pain. Other clinically proven ingredients include Arnica, vitamin B6 and choline—over eight years of research have gone into this product still produced by the same chemist in Southern California. This pain cream is non-sticky, stain-free and guaranteed to be free of any steroids or drugs. the cause of most pain. Ideal for use on degenerative diseases which affect the joints like arthritis. No temperature change so doesn’t give instant pain relief like other warming rubs. Many customers have noticed a reduction in swelling and inflammation but commented it doesn’t work on all types of pain. Expensive for just a 2-ounce container. Most of us have experienced this magical ointment from the Far East at some time in our lives. Enriched with herbs and functional emollients extracted from cajput, clove, mint and cassia, this reddish consistency muscle rub is classed as extra strength. Ideal for use on abdominal cramps, spinal ache, sore muscles and joint inflammation, Tiger Balm has also been lab-tested as effective in treating severe migraines. 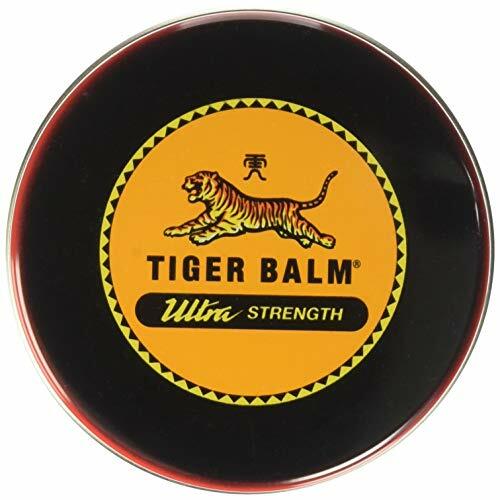 Always try to purchase a Tiger Balm that’s genuine and produced in Thailand—there are many fake and less potent formulas out there. This one only comes in a 3-ounce jar, but a little goes a long way. Simply rub gently into aching muscles for a warming relief, just maybe not before going out as it does have a strong odor. Herbal remedy that’s been tried and tested for thousands of years. Still one of the most effective sources of pain relief for sore muscles. Compact size is ideal for keeping in your gym bag (or travel kit) to ease any stiffness or muscle pain. Also effective in treatment of migraines. This formula is said to be extra strength. and best for use at night before going to sleep. so it may not absorb as well as some of the more modern formulated creams and rubs. Many customers find they’re allergic to Tiger Balm. Plenty of fakes available—that cheap tub you see in the local drug store will invariably be a much weaker formula. Any one of the muscle rubs or pain relief creams we’ve looked at could be effective for relieving the pain and swelling of muscle injuries or stiff joints. It all comes down to how much you want to spend, which is best for your type of pain and how discreet you want the cream to be. For the value for money it offers in a larger 16-ounce size and suitability for effective treatment of many muscle and pain issues, Dr Pat’s Pain Relief Cream is in our opinion, the best muscle rub you can buy in 2019. Suffering from muscle pain no longer means you have to smell like a high school locker room.